Chandra X-ray Observatory image of Sagittarius A and A*. Artist's impression of a protoplanetary disk being pulled apart as it falls toward Sgr A*. Sagittarius A (Sgr A) is a strong source of radio waves at the heart of the Milky Way Galaxy made up of several components. Sagittarius A West is a thermal radio source associated with three small arms of ionized gas and dust that are spinning around the center, and resembles a miniature spiral galaxy. Sgr A East is a nonthermal source, about 39 light-years across, that appears to be a supernova remnant. The very center of the Milky Way is marked by an intense radio source, called Sagittarius A*, which is probably a supermassive black hole. Astronomers have been able to obtain detailed information about the nature of Sag A* from observing a star called S2, which is in a small elliptical orbit around the object at the center. S2 is an elliptical orbit with a period of 15.2 years and a pericenter (point of closest approach) of just 17 light-hours (18 billion kilometers) from the center of the central mass. This gives an estimate for the central mass of about 4.1 million solar masses. All of this material must be confined with a region no more than a few light-hours across (since otherwise the star S2 would have fallen into it by now), leading to the conclusion that it must be a black hole. In 2012, astronomers reported seeing an ionized cloud of gas falling into Sag A*. 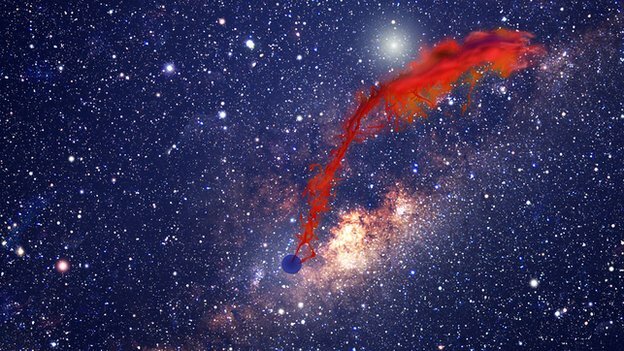 A team at the Harvard-Smithsonian Center for Astrophysics subsequently explained the observations in terms of a young, low-mass star and its protoplanetary disk plummeting toward the central black hole and being torn apart in the process. The fact that the doomed star has a system of planets-in-the-making is interesting in itself because scientists had doubted whether worlds could form in such an inhospitable place as the vicinity of a supermassive black hole. There are other stars in more stable orbits in a ring around Sag A*, and seems some of these may have planets despite their extreme circumstances. Surely no life could exist of them, given the intense radiation barrage they'd be continually subjected to. However, it's interesting to speculate on the view to be had of the central black hole and its environs from such a vantage point.